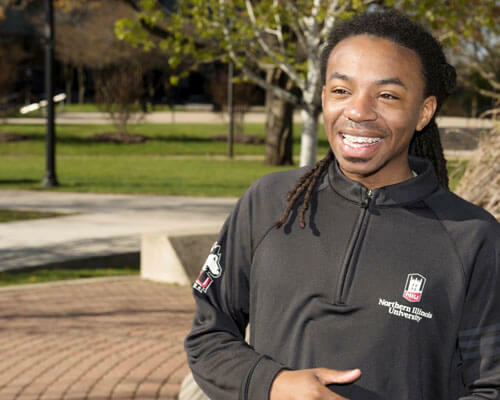 A decade ago, before Randiss Hopkins earned the reputation of NIU student leader and social entrepreneur, his life revolved around basketball. Growing up in the rough North Lawndale neighborhood on the West Side of Chicago, pick-up games of hoops at the local playground brought the community together. The lesson? Where you are from is important. Basketball also paved his way to Curie Metro High School, which recruited the talented player for his skills on the court. Curie promotes a culture of college and career readiness and encourages students to pursue higher education. Two majors are available: performing and visual arts or career and technical education. Mr. Felton shook his head. The lesson? Hard work pays dividends. 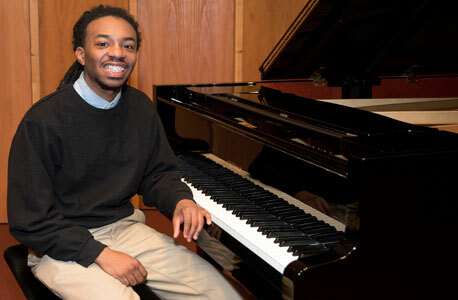 When Hopkins later gained admittance to the NIU School of Music, his attention turned not only to tickling the ivories and studying the ways of jazz but to joining student organizations on campus. That circle is leading Hopkins to a massive stage this week. The 23-year-old NIU senior, who will graduate in December, is among the speakers Thursday at We Day Illinois. 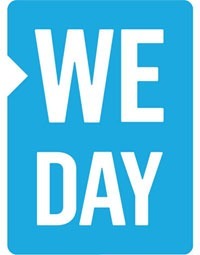 We Day, a movement of young people who are leading local and global change, is “taking the philanthropic world by storm” by bringing together internationally renowned speakers and performers with prominent activists and We Day’s co-founders. Speakers and performers appearing Thursday at the Allstate Arena include Jennifer Hudson, Selena Gomez, Common, Magic Johnson, Babyface, the Band Perry, Colbie Caillat, Martin Sheen and more. Between 15,000 and 20,000 are expected in Rosemont. 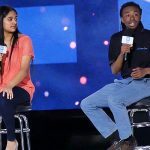 His time in the We Day bright lights will enrich an already illustrious résumé of student leadership and community service. After joining the B.R.O.T.H.E.R.S. organization at NIU during his sophomore year, his fuse truly was ignited when he participated in NIU Cares Day. 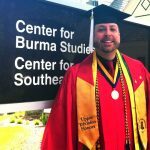 During the summer of 2013, he attended the Children’s Defense Fund leadership training in Knoxville, Tenn., where college students from across the country learned how to create their own social action programs. Hopkins convened the first planning meeting Aug. 24, 2013, believing almost immediately that “something great” would happen. Group members gathered weekly after that, culminating in the Save Chicago Day event of March 7, 2014. More than 120 NIU students volunteered to prepare meals for the homeless, undertake landscaping projects and impact the lives of more than 300 youth. Some of the teens told the caring-heart Huskies that they felt encouraged to follow their dreams. Others said they wanted to attend NIU. He also has continued to turn heads. Last month, he was honored among the 2015 class of Newman Civic Fellows – inspirational college student leaders who have demonstrated an investment in finding solutions for challenges facing communities throughout the country. Earlier in March, he coordinated a Spring Break collaboration between The Remember Project and After School Matters, a nonprofit organization that offers innovative outside-the-classroom activities to Chicago high school students – including, years ago, Hopkins himself. The lesson? Never forget your roots, no matter how successful you become. Of course, none of this means he won’t allow himself a moment to smile in the mirror. As he anticipates his Thursday walk onto the stage of the Allstate Arena for We Day, he feels “excited, ecstatic and thrilled,” not so much for the recognition but for the chance to motivate thousands to follow in his footsteps. “My mom, Robin, will get a chance to see me there. She’s extremely happy. I don’t think it’s really hit her yet. My little brother, Travell, who’s autistic, he’ll be there,” Hopkins says. I just wanna say I am so proud of you. Continue to do what god leads u into doing. Congratulations. Love you cuz. We are very, very proud of you, Randiss. So glad we’ve gotten to know you. What a talented and caring heart you have. I am so proud of you! Continue to be a blessing to everyone you encounter. You are definitely a blessing to me!